At the annual Food & Nutrition Conference & Expo of the American Dietetic Association this week in Boston, I had the opportunity to hear a disturbing presentation by Elizabeth Pivonka, PhD, RD, president and CEO of Produce for Better Health Foundation. Pivonka spoke about the organization’s most recent research on America’s produce consumption and the challenges we’re facing to boost our intake of fruit and veggie servings. The news was dismal. According to a national sample of children and adults, only 1% of adults and 2% of children consume the recommended minimum servings of fruits and vegetables. In fact, we eat less than half of the fruit we need and just over half of our veggies. 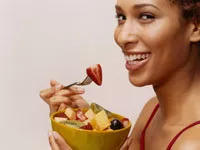 Most women require at least two servings of fruit and three servings of vegetables every day, but the more you eat, the better. Fruits and veggies play key roles in reducing many health risks, including heart disease, stroke, type 2 diabetes, and certain types of cancer. The research did find that children under 12 are getting slightly more produce, but teens and older Americans are eating even less than the averages for adults. The sources of our servings of fruits and veggies are another problem. Juice was the major contributor of fruit servings, but since 100% fruit juice lacks the fiber of fresh fruit, it’s not as satisfying and, therefore, doesn’t provide the weight-control benefits of other forms of fruit. Barriers women cite for not eating more produce include high cost, lack of availability when eating out, and lack of ideas for ways to eat more fruits and veggies or to prepare them. Here are my solutions for those barriers—they help me eat my produce quota every day. Don't balk on price: Fruits and vegetables are actually a bargain. What’s costly is the price you’ll pay for not consuming enough of them. You really can’t afford to not eat them when you look at the price of health insurance and health-care costs that you can be saddled with if you don’t. Do be smart when eating out: I travel more than anyone I know and still eat my fruits and veggies—even when I’m on the road. First, drink tomato juice on planes. Carry fruit or veggie snacks, like mini boxes of raisins or Sunsweet Ones individually wrapped prunes, in a travel bag, and make smarter choices when eating out. When I go to restaurants, I have oatmeal with fresh or dried fruit for breakfast, veggie-based wraps or soups for lunch, and I always have a salad course as part of dinner! Don't be intimidated: Cook what you know and love. Sure, I don’t know what to do with eggplant and artichokes, but broccoli is easily stir-fried, and there’s nothing to making tossed salads.